Joseph: A carpenter, though born of the royal house of David, Joseph was an upright man who, as husband of the Virgin Mary, cared for Mary and the child Jesus. Venerated in the East after the fourth century, and his cult flowered in the West during the fifteenth century, following the development of medieval nativity plays, the Christmas crib, and increased devotion to Mary. The feast of St Joseph was introduced into the Roman liturgy relatively late, in the fifteenth century, and extended to the universal Church mainly by missionaries in the sixteenth century. Patrick Duffy looks at how Joseph is seen in the Gospels of Matthew and Luke and in the liturgy. After the introduction of his feast into the Roman liturgy in the fifteenth century, devotion to Joseph was spread by the missionary religious orders of the Reformation. Pope Pius IX declared him patron of the universal Church in 1870. 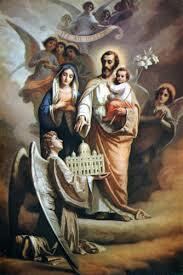 Pope Pius XII introduced the feast of St Joseph the Worker on 1st May 1955. In 1962 Pope John XXIII introduced Joseph’s (the Pope’s own baptismal) name into the Roman Canon (1st Eucharistic Prayer) of the Mass. Matthew’s gospel traces Joseph’s descent from Abraham and ends with the phrase “husband of Mary, of whom Jesus was born”. It seems here to decline quite deliberately from saying that he was the father of Jesus. Matthew also describes Joseph as “a man of honour”. When he learned of Mary’s pregnancy, he had already chosen the option of mercy and compassion when he decided not to divorce her publicly, but following some kind of encounter with God (“the angel of the Lord”) over the matter, he sensed God was asking him to take Mary into his home as wife, to treat the child as his own and to give him the divinely designated name, Jesus, thus indicating that “he would save his people from their sins” (Mt 1:18-21). Matthew’s readers will understand this to mean that Jesus fulfils the function of the atonement sacrifices of the temple. Matthew chapter 2 infers Joseph’s protection of the child Jesus against Herod, the flight into Egypt and subsequent return to, and re-settling in Nazareth . 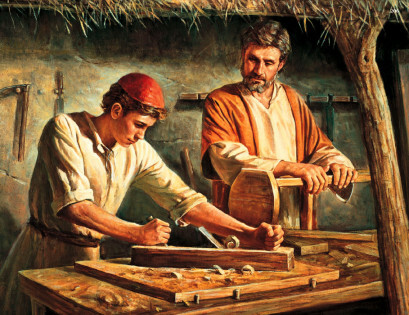 Also in Mt 13:55, Jesus is referred to – somewhat with contempt – as “the carpenter’s son”, without naming his adoptive father, as if Jesus were someone who had risen above his station and as if carpentry were a somewhat dishonourable profession. Luke’s gospel, whose infancy narratives are written from Mary’s point of view, records her as being perplexed at being told she is to conceive a son, even though she is described as engaged to Joseph. It does not mention Joseph’s dilemma, but at the start of Jesus’s public ministry it says: “He was the son (as was thought) of Joseph, son of Heli” (3:23). However, the care of Joseph for Jesus is the background of Luke’s narrative (chapter 2) of the birth of Jesus at Bethlehem, his circumcision and naming, his presentation in the temple, the worry of the loss in Jerusalem when Jesus was twelve and having to cope with Jesus saying he would be busy with his Father’s affairs. whom you placed at the head of your family. the virgin Mother of God. conceived by the power of the Holy Spirit…. Catholic devotion has traditionally seen Joseph as the patron saint of a happy death. For a longer reflection, see Redemptoris custos (“On the person and mission of St Joseph in the life of Christ and the Church” Apostolic Exhortation of Pope John Paul II 15-8-1989).